The Rebel Sweetheart. 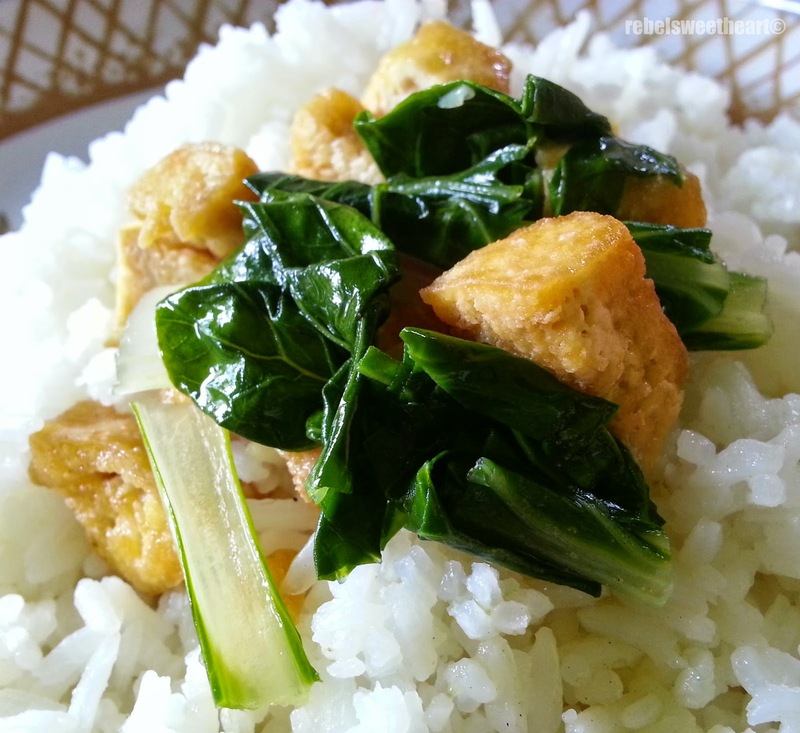 : Foodie Goodie | Sauteed Bokchoy with Tofu. 1. Fry the diced tofu until brown and crisp. Drain and set aside. 2. In the same pan, saute the garlic and onion. 3. Put back the tofu, then add the oyster sauce and half-cup of water. Simmer for a minute or two. 4. Put the bockhoy, then add the chicken broth. Simmer for a few minutes or until the bokchoy has softened. Wow, that sounds SO good. Neat way to use tofu!! It is so hard to get bokchoy at our local market. Some times they have it, other times not at all! I have to admit, I don't think I've ever tried tofu in my life. I'm a little nervous about it for some reason. This dish does look good though! That looks like a delicious healthy meal. I will have to try and make it this week. This is so similar to my own recipe!!! That's so funny. Only I use vegetable broth instead of chicken broth, and I add golden mountain seasoning, as well as a little sesame seed oil drizzled on top at the end usually. That looks really good. I would like to make this. All the ingredinets are things I like. This dish looks amazing even though I am not a fan of tofu. I love tofu! This looks delicious! Love this recipe! The dish looks yummy and delicious! Really a simple recipe with tofu and bokchoy. Will have to try this for sure. Thanks for sharing this.